Last night’s episode of Scandal was in one word – AMAZING*! I am guilty of being one of those viewers who likes to anticipate what is going to happen when watching shows, movies, or reading books. Maybe it’s because I’m a tad impatient and a wee bit analytical, but dang-nab-it there’s a certain level of satisfaction I get from accurately predicting the outcome. 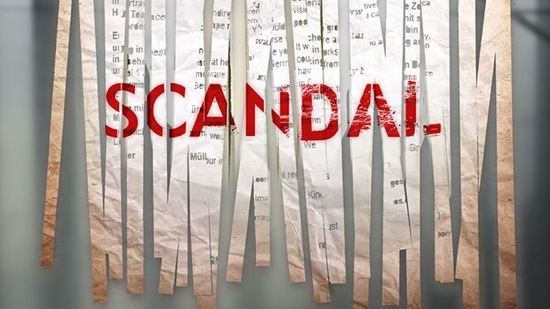 I also quickly become bored with media that doesn’t force me to engage in some degree of detective work – which brings me to this week’s epi of Scandal that had me guessing from beginning to end (with the exception of that parking garage scene with Huck & Quinn/Robin…I so called that!). So you’re telling me the bomb goes off & my fav Byron Douglas may die….WHAT?! I love how Shonda Rhimes plays puppet-master with our heart strings every week, and yet we keep coming back for more – lol! Aside from the drama, love triangles, rapid-fire speaking, and occasional lip quivers – the one thing that amazed me the most was the clever use of camera angles and positioning to conceal Kerry Washington’s pregnancy. I’ve come to affectionately term the show’s pregnancy concealment as ‘The Claire Huxtable Effect’, as it reminds me of the attempts made by ‘The Cosby Show’ to conceal actress Phylicia Rashad’s real life pregnancy. 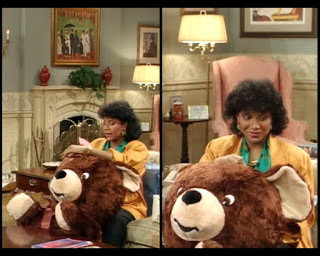 She was frequently filmed in bed, sitting at the table, or more obviously posed seated behind large stuffed animals. Camera trickery seems to have advanced a lot since the late 80’s/early 90’s, as it was easy to forget that Kerry Washington was pregnant. Kudos should definitely be given to whomever is behind directing those scenes, because for Olivia Pope to appear even remotely pregnant would be, in a word, Escandalo!